Quietly Making Noise, LLC (QMN) has provided acoustical consulting services for many new and existing projects that involve residences or other sleeping rooms in buildings located immediately adjacent to rail lines. Principal Acoustical Consultant Lisa Schott brings a unique range of experience in design, construction, testing, and troubleshooting to create innovative solutions for challenging noise and vibration issues in hotel, hospital, and multi-family projects. Quietly Making Noise is familiar with and regularly designs projects to meet the generally accepted industry guidelines and regulatory standards for residences and sleeping rooms in hotels and hospitals, including the reduction of noise from exterior sources such as freight train and light rail lines. Following is a list of some projects that have been completed or are currently in progress. We work closely with the client to design multiple noise mitigation options that the architect, builder, and facility operator can agree upon, considering cost, constructability, schedule, aesthetics, and other considerations. Oakley Station Apartments, Cincinnati, Ohio – Acoustical testing of rail yard noise inside and outside residential buildings. Development of retrofit noise mitigation measures. Station House Apartments, Lake Mary, Florida – Evaluation of train horn noise at multi-family residential buildings. The Fountains at New Bern Station, Charlotte, North Carolina – Mid-rise multi-family residential buildings. Acoustical evaluation of design for both interior and exterior noise. Development of noise mitigation measures necessary for adjacent light rail tracks and station. Woodfield Silos, Charlotte, North Carolina – Mid-rise multi-family residential buildings. Acoustical evaluation of design for both interior and exterior noise. 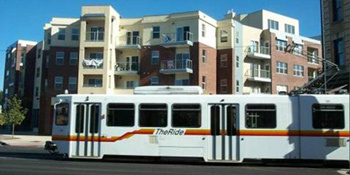 Development of noise mitigation measures necessary for adjacent light rail tracks. Potomac Yard Monroe Square, Alexandria, Virginia – Mid-rise mixed use project. Acoustical evaluation of design for both interior and exterior noise. Development of noise mitigation measures necessary for adjacent freight train rail line, highway, and airport. Tapestry Brentwood, Brentwood, Tennessee – Mid-rise multi-family residential buildings. Acoustical evaluation of design for both interior and exterior noise. Development of noise mitigation measures necessary for adjacent freight train rail line. Jamison Station, Franklin, Tennessee – Mid-rise multi-family residential buildings. Acoustical evaluation of design for both interior and exterior noise. Development of noise mitigation measures necessary for adjacent freight train rail line. Woodfield Elizabeth II, Charlotte, North Carolina – Mid-rise multi-family residential building. Acoustical evaluation of design for both interior and exterior noise. Development of noise mitigation measures necessary for adjacent freight train rail line. White Furniture, Mebane, North Carolina – Mixed use project, renovation of furniture factory. Acoustical evaluation of design for both interior and exterior noise. Development of noise mitigation measures necessary for adjacent freight train rail line. Woodfield West Ashley, Charleston, South Carolina – Garden style multi-family residential buildings. Acoustical evaluation of design for both interior and exterior noise. Development of noise mitigation measures necessary for nearby freight train rail line. Quietly Making Noise has extensive experience analyzing, testing, modeling, and evaluating a wide variety of exterior noise sources, including highways, rail lines, airports, outdoor dining and entertainment venues, recreational facilities, and outdoor mechanical and electrical equipment. Please contact us for further discussion of your project-specific noise issues.